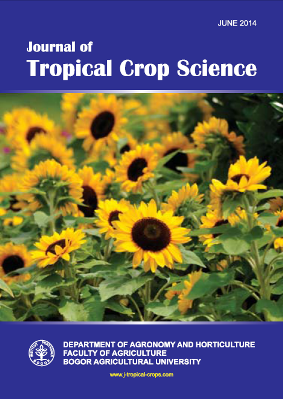 The research was conducted at Leuwikopo Experimental Field and Plant Breeding Laboratory of IPB, Dramaga, Bogor, West Java, Indonesia from October 2012 to April 2013. Crossing population between C15 and C2 genotype were used to study genetic parameters for quantitative characters in pepper. All the characters were not controlled by maternal effect, except fruit length. Broad-sense heritability were high for plant height, stem diameter, dichotomous height, days to flower, days to harvest; and medium for fruit length and diameter. Narrow-sense heritability was high for stem diameter, dichotomous height, days for flowering; medium for plant height, days to harvest; and low for fruit length and diameter. The ratio of additive variance was high for all the characters, except for fruit length and fruit diameter.